This one teeny-tiny little problem. I like books a lot. I have had summer jobs for over 10 20 30 years just to pay for my book habit. Develop a state of the art classroom library that students will want to and will be able to read. Make sure every word of every book is read so no surprise language exists anywhere. Represent the diverse culture we see in our current world. Here are pictures of book covers of some of the books recommended for the libraries of students in grades 3 – 5. Rigby’s Where does Food Come From? The group shared some of the things they had learned before a quick guided tour of the book review work. Titles for book bins do matter so the labels will be preprinted. Curating a collection of books that will sustain students’ interest is hard. High-low books are not all equal for middle school readers and finding age-appropriate and conceptually appropriate leveled books for MS students is tough. Lucy reiterated that these would NOT just be your favorite books and few picture books would be included in classroom libraries. Why? Because 4 student chapter books could be bought for the price of one picture book. The few that are included will be in the brief “Read Aloud” section of the shelf! What books do you know? What books look interesting to you? I ordered (10 books) and saved copies of those book covers during the session (to my “blog pictures” folder on my desktop). Ten was my limit! I read through my notes on Sunday and pulled the pictures of the remaining book covers and spent time perusing Hameray and other book publisher sites. A.lot.of.time! (Remember I said I had a book problem. Did you really think I could click without stopping to read? I had to look up Joy Cowley and then I was interested in her woodworking and then back to just how many Mrs. Wishy Washy books are there? Wonder . . . I created the opening, defined my categories, added the tags and then pasted in my notes from my Word Document. I did have to reload all the pictures into WordPress, but I had put the names into my doc so it went quickly. Thank you, Anna, Betsy, Beth, Dana, Deb, Kathleen, Stacey, and Tara. Check out the writers, readers and teachers here. 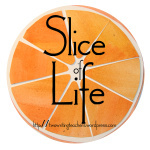 It’s the March Slice of Life Challenge so be ready to read DAILY posts!